Mongolia is a rugged, land locked country nestled between China and Russia made up of vast Eco regions and deserts and is truly one of the world’s last undiscovered travel destinations. 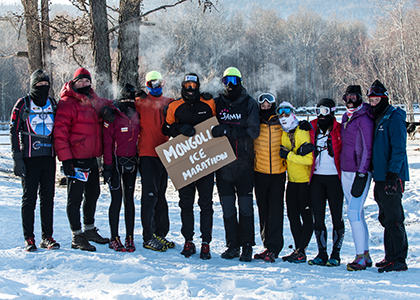 So when the opportunity presented itself to join in on an expedition to Outer Mongolia to experience not only the culture of a vastly different country but to also run the inaugural Ghengis Khan Ice Marathon in temperatures reaching -40 degrees Celsius along the frozen Tuul Gol river, I couldn’t resist. Mongolia is a country that has escaped the influx of tourists and westernisation and would offer unparalleled experiences in a harsh and brutal yet pristine and evocative landscape. Such extreme cold brings with it a range of dangers, at 40 degrees below you feel the cold in your lungs, you feel it touching your blood, it’s hard to take deep breaths of air this cold without reflexively coughing and it doesn’t take long for any exposed tissue including inner nostrils and eyeballs to freeze, dangerously freeze! My biggest concern prior to the event was frostbite and hypothermia particularly as I suffer from Raynaud’s; poor circulation in my hands resulting in fingers becoming numb in even mildly cool temperatures, quickly reaching critical stage of losing all functionality of them. I kept my body and core temperature stable with 2 layers of X-Bionic bottoms and 3 layers of X-Bionic tops, combined with a Soma Stormcap face mask, buff, 2 pairs of socks and on my hands I used a base layer glove topped with Kappa down mitts from PH Designs with the ultimate solution of ‘Hotties Hand Warmers’ without which I would have surely suffered. 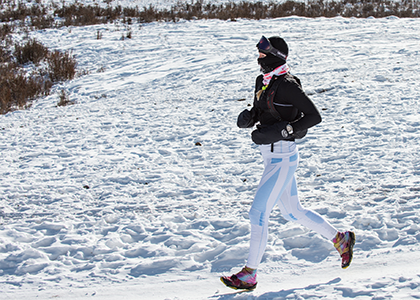 I built up to the race by working on a structured training plan that included weekly sessions of speed sessions, hill work and long runs with my average weekly mileage ranging from 40-60 miles, also incorporating twice weekly strength and conditioning Crossfit workouts to ensure my body would be strong and flexible to handle the impact of running on a slippery and icy surface. For the first time ever I was wishing for snow so I could train in more realistic conditions and enjoyed some last minute snow running in the Pentland hills over the last couple of weeks prior to the race. 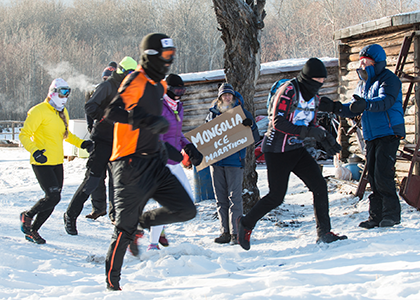 The weather conditions on race day were near perfect with clear skies and only a touch of wind with the temperature at the start recorded at -34 degrees. To keep the competitors as safe as possible the route started and finished at our nomadic camp following some trails before turning onto the ice river surrounded by mountains on either side. The surroundings were pristine and I felt like an explorer off into the unknown with the ice singing under my feet and echoing musically in the trees. The initial sounds were unsettling hearing the ice shifting and moving underneath you with the occasional crack of ice where my foot would drop down an inch, just enough to bring my attention back to full focus, with my Due North ice grips over my Brooks Pure Grit shoes working their magic to keep me gripped firmly to the slippery surface of the frozen river. It was magical to weave along the path of the river passing the occasional local on horseback or small herds of cattle that were somehow grazing on goodness knows what in all that ice. I don’t know who stared more at each other whether me at the locals in their fur clad costumes or them at me in my X-Bionic snow outfit. I was always conscious of the threat of wolves in the area but the comforting sounds of husky teams barking and howling in the area alleviated that. My race went to plan, I held a steady pace and claimed 1st female, running comfortably within myself that I could have actually kept going. 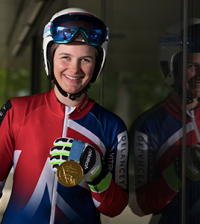 The temperatures surprisingly were not a hindrance as I initially thought they would be, especially in relation to my fingers which stayed toasty the entire race but it was the altitude of 1500m mixed with the frozen vapour and nose secretions that made breathing very difficult. I had taken Doctor Andrew Murray’s advice (first overall) the day before the race to cut a mouth hole in my X-Bionic Soma Stormcap face covering which definitely helped that situation somewhat. The biggest surprise came the following days where we (all the runners) felt none of the usual aches pains commonly known as DOMS, particularly after running on a hard impact surface such as ice, which I put down to the cold temperatures preventing the muscles from inflaming. The race is more than an event it’s an entire adventure, put on by the fabulous team at Sandbaggers, in a vast and rugged landscape which brings a special and unique feeling of solidarity and camaraderie with the entire team of runners and supporters alike that have developed into strong bonds. 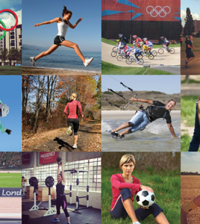 It’s an experience to challenge your mind and body and be rewarded with everlasting memories of a beautiful country.